Roses must surely be one of the most evocative flowers there is. Most people love them, for their form, their colors and often for their perfume too. Some of us dream of bathing in baths surrounded by floating petals, or sleeping in beds filled with roses. Yet for gardeners, who must deal with the practical part of realizing dreams, they are frustrating plants. There are hundreds if not thousands to choose from, so simply making a choice of what to plant, and what you think will match your idea of a beautiful rose, is hard enough. 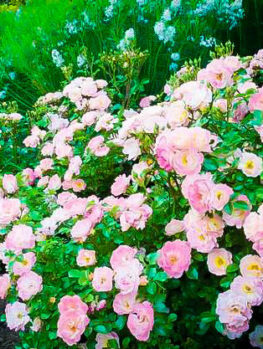 But the real work begins after they are planted, because roses are not among the easiest of plants to grow, since they usually require careful growing, fertilizing and protection from diseases and pests. The reality of growing roses does not always match the dream. The dream itself, however is harder to put aside, and so we search for that rose that will be constantly in bloom, easy to grow, colorful and resistant to pests and diseases. Gardeners may think they are alone in that quest, but they are not. Skilled rose breeders are on the same quest, and some have succeeded. Many people have learned about – and planted – the Knockout Roses. These are a real breakthrough in overall toughness and specifically in disease resistance, flowering continuously with little input from you, and bringing almost continuous color to your garden. Now, to fill a niche for similar hardiness, disease-resistance and continuous flowering, but on smaller plants, there are the Drift Roses. These roses grow just 18 inches tall and form a spreading mound 2 to 3 feet across, depending on the variety. Planting in groups spaced 18 – 24 inches apart they will form continuous drifts of vibrant color along the edges of your garden beds, or plant them alone in smaller areas. Each branch ends in a branching cluster of many flowers, upright or slightly cascading. The plants bloom prolifically and continuously from spring to fall. The flowers are small, but make up in profusion what they lack in size. Most have many petals, between 15 and 35 in each flower. Some are more open in form, and other look exactly like miniature versions of roses that could have come from a florist shop. These plants are mostly hardy to Zone 4. This means that without any winter protection they will survive winter temperatures as low as minus 30 degrees. Natural snow-fall will also provide protection. Equally, they will grow in even the warmest parts of the country, such as southern Florida and California. There they will bloom almost all year round, and keep most of their foliage through the winter too. They will grow in any soil that is not very dry, or always wet. The ideal soil is a rich loam or clay, with plenty of organic material added before planting. The acidity or alkalinity is not important, although very acidic soils may cause some slowing of growth. They benefit from a regular supply of water, and the use of compost and fertilizer to maximize their growth and blooms. Full sun is best, or at least 6 hours of direct sunlight a day. 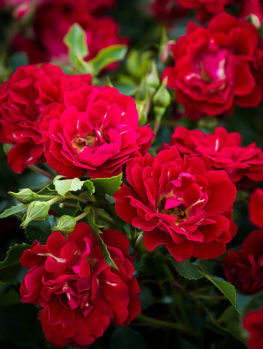 These vigorous roses will tolerate some shade better than many other roses, but for best development and maximum flowering, a sunny location will give you ideal results. 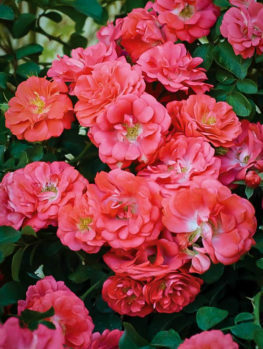 These roses stay low and close to the ground, so they are perfect for planting in front of larger shrubs. They can be planted along the edge of a bed to bring color and to make the bed look ‘finished’. If you are planting along an edge with a lawn, place the center of the plants 18 – 24 inches back from the lawn, so that they do not spill out over it, which makes mowing the grass difficult and could damage the plants. You can plant closer along a path or driveway, as the mounding and cascading foliage will soften the hard edge and look charming. 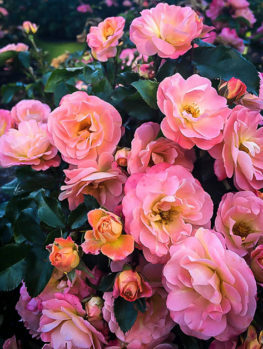 These roses can be planted singly in a small garden to bring lots of color, or in groups and drifts among other low-growing shrubs and flowers. Create a bed around a tree growing in a lawn, and fill it with these gorgeous roses, for a spectacular effect. Plant at the top of a wall, where the branches will spill over and down to soften the hard edge and create a graceful effect. Planting on a slope will turn a boring area into a color carnival. 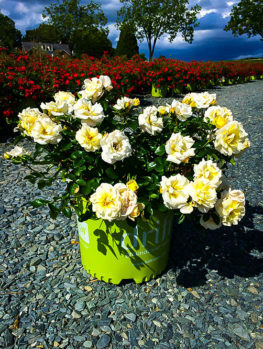 Because of their small size, these roses are ideal for planter boxes and containers. 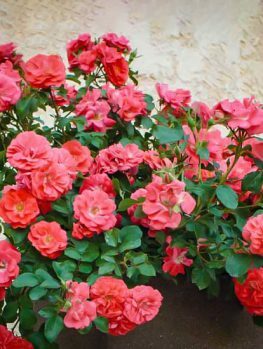 Instead of replanting annual flowers constantly, fill your planters with Drift Roses – they will bloom for just as long as flowers do, and they will come back the following year without any replanting needed. 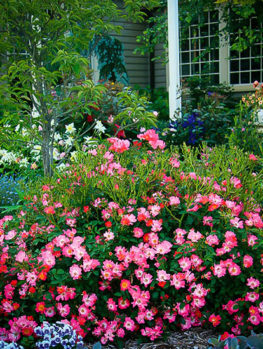 All kinds of tubs and containers – even an old garden barrow – look wonderful planted with these ever-blooming roses. If you don’t have a garden, you can still grow these plants on a balcony or patio – and enjoy their beauty. Most of us know that there are different kinds of roses – climbers, hybrid teas, floribundas, and so on. Each has its own characteristics and special features. Each requires different growing methods, and has different strengths and weaknesses. 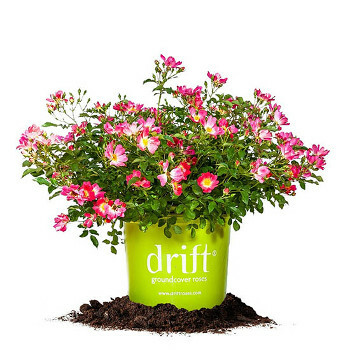 The breeders of the Drift Roses had an image of what they wanted. They knew that most roses grew into large bushes, 3 to 6 feet tall. Many gardeners wanted smaller roses, that would only be a foot or two tall, and could be planted in drifts, or as the front of beds. Small gardens did not have the room for a big rose bush, and needed something smaller to match the scale of the garden. All this meant that the first thing on their ‘wish-list’ was a small plant, just a foot or two tall, with a similar spread. The second thing they knew gardeners wanted was continuous flowering – plants that would bloom in spring, summer and into fall too. Thirdly, gardeners wanted tough plants that did not need constant spraying for diseases. So how to create this? There is a group of roses called ‘groundcover roses’. These are a mixed group, but all of them are wider than they are tall, and most are fairly low-growing. Many are very disease-resistant, but they mostly flower in spring, with perhaps some additional flowers later in the year. A second group of roses are called ‘miniature roses’. These are very small plants – some less than 12 inches tall. They have beautiful miniature flowers, and are often sold as pot plants. Most of them flower continuously, a great thing for garden plants. The breeders took selected plants from each group and crossed them together – a groundcover rose crossed with a miniature rose. One of the parents they used, for example, is a famous historic rose called ‘The Fairy’, which is renowned for its toughness and continuous blooms. They made many, many crosses with many different varieties, collected the seeds and grew the plants. The selected the ones with the best flower size, color and form. Then they reproduced each one many times over from cuttings, and grew them in beds to see how they performed. From the hundreds of plants they had, the best eight were selected. These were the most attractive, the most colorful, the ones most resistant to diseases, and those that stayed low to the ground. Those eight plants are the Drift Roses. Each one has been carefully trialed and tested to give you as close to the perfect small rose bush as exists today. Who were the skilled breeders who developed these special plants? They were none other than the renowned rose breeding family Meilland. Based in France and established around 1850, several generations of the family have been rose-breeders. What is perhaps the world’s most famous rose – the ‘Peace’ rose, and the almost as famous ‘Papa Meilland’ rose, are products of their efforts. 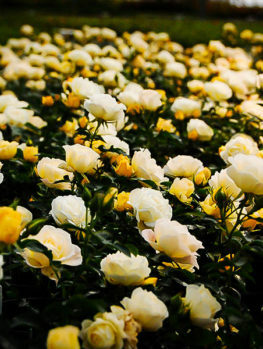 In recent years they have turned their attention to diversifying the range of roses available, and making roses tougher, more disease-resistant, continuous flowering and easier to grow. The Drift Roses are a highlight of that work, and more evidence of the skill of this premier business. A prestigious American nursery – Conard-Pyle (Star® Roses and Plants) – was responsible for bringing the ‘Peace’ rose to America and have worked closely with the Meilland family since 1932. When they saw this latest development, they knew that American gardeners would love these remarkable roses, and they arranged to bring them to America and grow them for distribution across the country. The eight varieties of Drift Roses are similar, but each is also different. The colors cover the range from white to deep red and yellow, and all are low-growing and bloom continuously. Apricot Drift – ‘Meimirrote’ PP#23354 – Each double pink flower is flushed with apricot, especially in the center. This delicious color will light up the garden from spring to fall. Coral Drift – ‘Meidrifora’ PP#19148 – In rich tones of deep pink and vibrant coral, the flowers cascade from the plant in continuous profusion. Peach Drift – ‘Meiggili’ PP#18542 – Exceptionally disease resistant and continuously blooming, the gorgeous double flowers on this rose are a delicate soft-pink with peachy overtones. It is more compact, and ideal for the smallest garden. Pink Drift – ‘Meijocos’ PP#18874 – the single flowers on this plant are mid-pink, fading to white in the center of the flower. 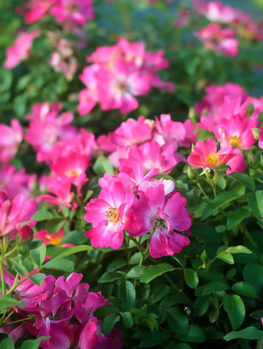 This plant has a more natural, ‘wild-rose’ look, on a low plant that flowers continuously. It spreads a little wider than the other varieties, making it ideal for covering larger areas. Popcorn Drift – ‘Novarospop’ PP#24773 – this brand-new variety from the breeders at Conard-Pyle present a completely new coloring. The semi-double flowers are golden-yellow in the bud, but turn to white as they open, making the bush look just like a bowl of delicious, buttery popcorn. This variety is hardy to Zone 5. Red Drift – ‘Meigalpio’ PP#17877 – The tiny flowers are born continuously in this outstanding variety, which is probably the pick of the bunch for beauty and elegance. Their rich red color stands out in the garden, as the plant cascades over rocks, from pots, or edges your garden beds. Definitely a ‘must have’ rose bush. White Drift – ‘Meiggili’ PP#18542 – If you love pure-white for the way it brightens the garden, then you will love the endless display of flowers on this rose. Each small flower has as many as 35 petals, forming a densely-double rose. These grow from spring to fall, set against a background of healthy, deep-green foliage. This rose is slightly less hardy than the others, growing only as far north as Zone 5. Sweet Drift – ‘Meiswetdom’ PP#21612 – As perfectly formed as a florist’s rose, these pink flowers are fully-double, and set against beautiful glossy foliage. They never stop coming through the whole season. The winner of multiple garden awards. Step 1 – Prepare the ground well with plenty of rich compost or rotted manure. Step 2 – Dig a hole the same depth as the pot, and twice the width. Step 3 – Remove the pot and place the plant in the hole. Step 4 – Put back 2/3 of the soil, and firm it down around the roots. Step 5 – Fill the hole with water and after it drains away, put back the rest of the soil. Water the pot thoroughly the night before planting. 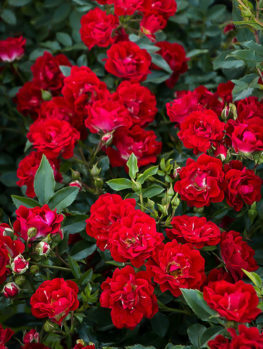 Roses love rich soil, so add plenty of garden compost or rotted animal manure. If you don’t have these, other types of organic material are also suitable. Mix the material into the soil where you are planting, using a spade or fork to turn over the ground 8 – 12 inches deep. To plant, dig a hole to the same depth as the pot, but wider. During the first growing season, water once or twice a week, or more if the weather is very hot and dry. Roses should not be allowed to become completely dry, especially in summer, as this can reduce flowering. The Drift Roses are easy-care plants that will thrive with very little attention. But like all roses, they benefit from some basic care, and they will reward you many times over in sturdy growth and continuous flowering, in return for just a little attention. During the first season, water your plants at least once a week. They may need watering more often if the weather is hot and dry. After that they will only need water during dry periods. Although rose plants are moderately drought-resistant, they bloom best, and continue to bloom through summer, if the soil does not dry completely. You can reduce the need for watering by using mulch to protect the soil from direct sun and evaporation. The best mulch is rich organic material like compost or rotted manure. Cover all the root zone, but keep the mulch a few inches away from the stems. Roses thrive on plenty of fertilizer. Mulch each spring with a 2-3-inch layer of compost or rotted manure. You do not need to remove the old mulch – just cover it over with fresh, new material. A Commercial rose food, applied according to the directions, is a good way to get maximum blooming. These can be organic or not, as you choose, and slow-release fertilizers are particularly helpful because they only need one application a year. Liquid fertilizers are valuable in the first year, because they reach the root zone quickly, and root development in that year is still limited. These tough roses can be left to grow naturally, but you will extend their life and maintain their health and blooming if you trim them in spring, before the new growth begins. Remove any dead parts and any weak branches at ground level, or where they grow from stronger branches. Trim away pieces that flowered the year before. Shorten back the remaining sturdy branches so they are 8 to 12 inches long. When the plants are older, remove one or two of the oldest branches at ground level each spring. It only takes a few minutes to trim a plant, but the result will be vigorous, strong growth, and maximum blooming for the longest period possible. These roses have been specially bred and selected to be resistant to disease, and the ‘normal’ rose diseases will have little or no effect on them. However, pests like aphids can occasionally attack new growth. These insects are easily dealt with by spraying with a little soapy water, or with a safe insect-killer from your local garden center or hardware. There are also special blended sprays available that give complete protection to roses from all problems.